Summers may be a time to relax! But you must do some unique or exciting things for your kids who are reminding you every five minutes that they are bored, therefore deciding the best and appropriate summer activities for kids are very important. The trick must be planned ahead. According to summer experts, parents can take advantages of the sunny days and warm nights of summer to plan something new for their kids’ activity. You can hold regular art workshops for your kids and other local kids. Involving them in brightening cards, bags, envelops and tags with graphics, fruits, vegetables, food items can keep them engaged throughout the summer. Grandparent Greetings: Haul out the craft materials and set up a hallmark home business. Let your kids to create amazing cards with stickers, cut-out magazine photos, glitters, or whatever your toddler likes to use for decoration. Ask him what he wants to say to the recipient and let him/her write it on their own. Make sure that his thoughts must are well reflected in the card. 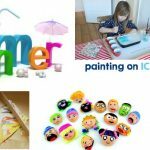 These Summer Activities for Kids will also help your child to enhance his imagination and creativity. When the weather gets clear, let your child stamp the envelope and slide it to a mailbox so that their creations reach the actual destination. Family Photo-Bingo: The summer is the perfect time for you to teach your kids many unknown things staying at home. Improve your child’s memory and let him remember who’s who in your family tree by this activity. Take at least nine photos and arrange them into three rows. Now give your child nine cards or checker pieces which he can serve as bingo chips. Anyone can call out ‘Daddy”, “Grandpa”, your kid will cover the photo with the cards. Whoever gets three in a row will win. This activity will surely give joy to your child as he will get to know many unknown faces and their relations to them. Family Room Picnic: First, you have to create a picnic atmosphere inside your house as it is really difficult to do picnics outside your house or in the lawn during the hot sunny days. Grab a basket to keep food that will add a flavor of the picnic to it. If you don’t have a food basket, a laundry basket will do the same job. Choose some picnic foods and let your kids pick up the foods themselves. You can assemble water bottles, juice boxes, raisins packets, string cheese, napkins, and plates. The kids will get busy in filling the basket. Meanwhile, spread a blanket in your family room and unpack the lunch to enjoy the roomy picnic. It can be an exciting plan for summer Activities for Kids. Super Fun Balloon Rockets: Kids love balloons for its fun and frugal entertainment. It can also be a great science tool. To start making it, you must tie one end of a string to the back of a chair. Take a drinking straw and thread it onto the other end of the string and tie the string to second chair. Take two pieces of a tape and attach it to the center of the straw. Then inflate a balloon and hold the opening of it so that the air does not escape. Now attach it to the straw by using a tape. Pull the balloon from one end of the string and let it go. The balloon will start to move then. It works according to the concept of action and reaction. When you let it off, causing the air to rush out from the opened end, a pushing force in the opposite direction is created which moves the balloon. Making Sugar-Cookie Pizzas: The youngest chef of your house can definitely make this pizza item for you and other members if he gets help from you. This is a very exciting and simple summer activitiy for Kids. Making this will help you in your cooking works for snacking period and the kid will learn to make it in a fun-loving way. Take out the roll of sugar-cookie dough from refrigerator and slice several thick cookies from it. Now put a cookie sheet and flatten them to widen them and wait for ten minutes to cool. Finally, your child can decorate their pies with strawberry jams or red icing for sauce. You can also shred coconut for cheese. This delightful pizza will add an extra flavor of taste as it will be made by the little hands of your family. Water Marbles: Start the project with tiny plastic balls, available online. Empty the packet of balls in a medium bowl and pour water to fill the bowl up and wait for 6-7 hours to watch the magic happen. You can see the bowl is filled up with water marbles. Look closer to get a clear view of them. Once they get into a big shape, drain the water from the marbles and you will find out cool gel marble balls. Collect them in a clear jar. If you add water to the jar, the magic marbles will disappear and you can find the jar transparent. If you want to get colored water marbles, soak the balls in the color and the marbles will catch the color easily. These are the suggestions for you to make your kids’ summer days more special. These fantastic and unique ideas will engage your kids in the summer days so that they will get no chance to request you to play outdoor games in the scorching heat. You can also make some other plans for summer activities for your kids, like bake cookies for ice cream sandwiches, volunteering at the nature center, visiting the beach and collecting shells, water balloon fight, having a campout indoor and have tricycle race in the park etc. Start creating your summer bucket list ready for the Summer Activities for Kids. No doubt that this summer your kids will enjoy to the fullest with you, without getting bored, if you pick any of these summer activities for kids!